Welcome to Hotel in Dubrovnik! This website is dedicated to the wonderful city of Dubrovnik in Croatia. If you are thinking of visiting Croatia, then a trip to the gorgeous coastline in Dubrovnik is well worth a visit. The city has a rich and varied history and is becoming one of the top places to visit in the world. Dubrovnik strikes you first as being a beautiful city, and unlike many coastal resorts, it is also blessed with stunning architecture from it’s rich Balkan history. To read more about the History of Dubrovnik, visit the History of Dubrovnik page on this blog, which will give you an overview to this fascinating city. Dubrovnik has plenty to do in and around the town, with it’s unique location, long history and being geared for tourists. How can you maximise your time in this city? 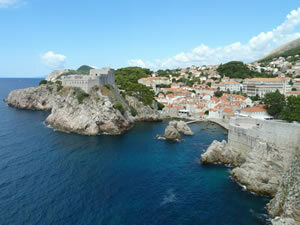 Check out the Things to Do in Dubrovnik page on this website. This will give you some ideas on what to do in Dubrovnik. One of the most popular activities in Dubrovnik is the Dubrovnik Summer Festival. Millions of people from across Europe head to the city for two months of cultural festivities. To find out more about the event, which happens in July, please visit our page on the Dubrovnik Summer Festival page. Have you been inspired and want to head to Dubrovnik? See below for some of the top Hotel in Dubrovnik.